I'm seriously considering getting one of these, there is a tiny problem though. 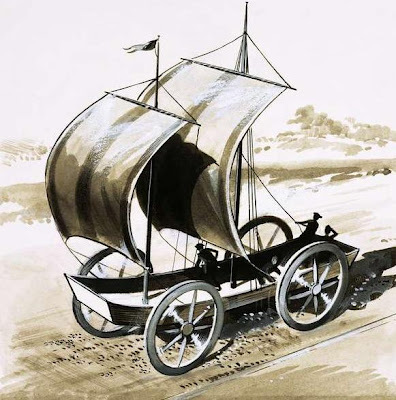 The wind — where do I find the wind? Do you think it easier to find two strong guys? 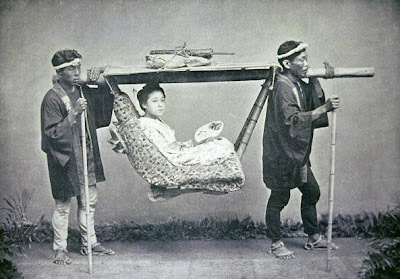 The 'Kago' Japanese travelling chair, 1890. Or horses, but I'm not a horse person — I do love them, but I have no idea how to care for them. And where should I keep them? Don't you think this treadmill bus looks intriguing — if I had one of them I could invite people on my trips. Transportation is a problem! The car didn't start today — again. So I had to hurry in an cancel an appointment — and two more later this week, as I don't know when I'll have a care that will cope. It's rather frustrating and I have to admit that I wasn't happy! 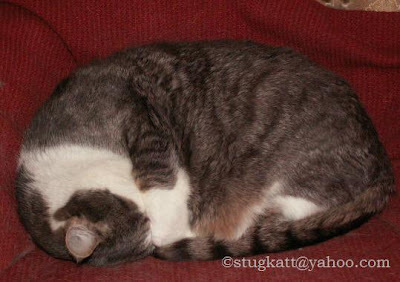 But I don't think my darling is sorry to miss the vet's appointment tomorrow! Well, I appreciate that I don't have to leave the house - I love to potter around not having to think of any appointments. Tried to convince my son that he should get a treadmill bus instead of a Golf TDI, but no success, though he says it's :lovely". Hope your car problems are resolved soon and not expensively! 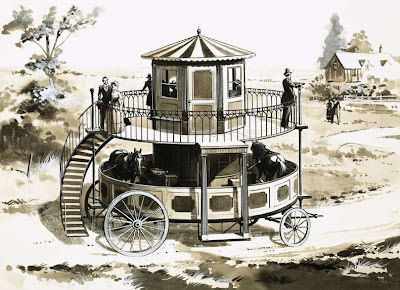 Yes, the treadmill bus is lovely - but that's perhaps all it is.. I'm still waiting to get help with the car, praying I can afford it! Which reminds me - I have to let her in now for the night, it is way too cold for Madame's liking to stay outside for longer than 2 hours. Your darling is much braver than mine. He has only recently started to spend some time (10 or 15 minutes) on the verandah every day. Women are hardier than men!